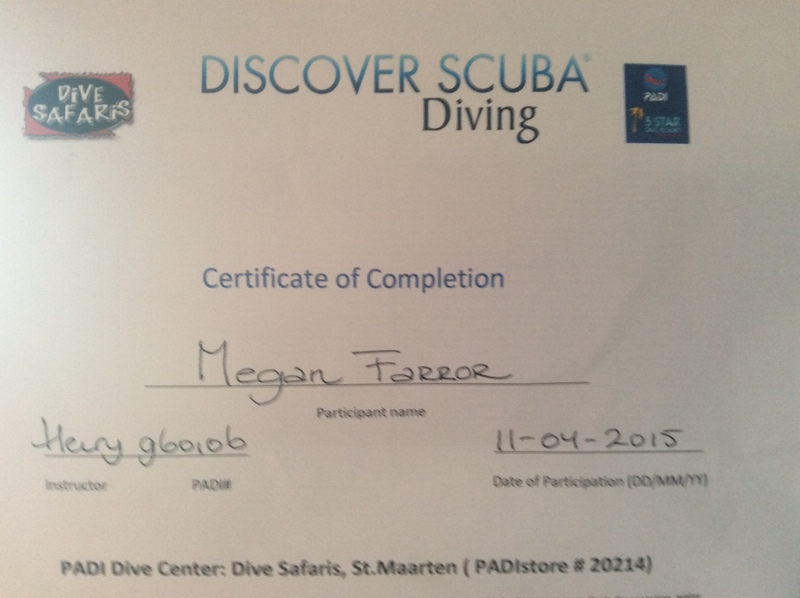 Owen has been snorkeling deeper in search of treasures on the bottom. 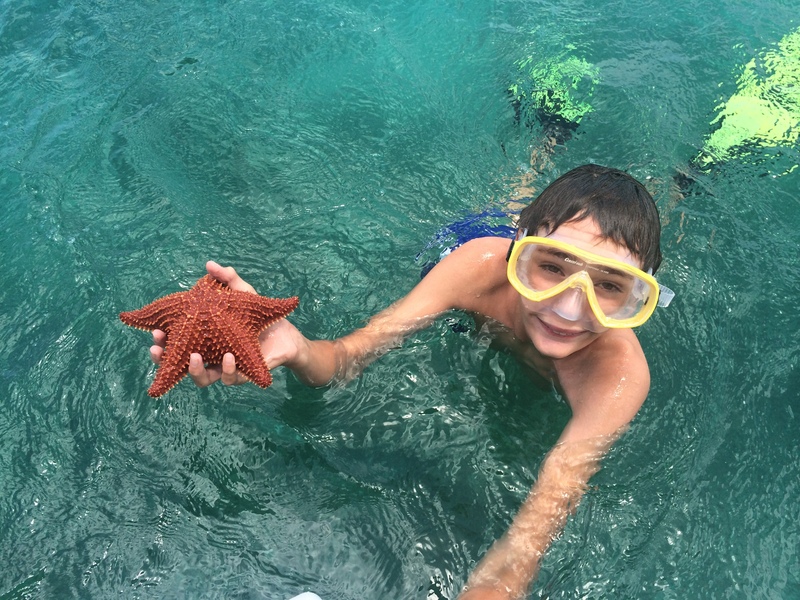 Here he holds a starfish he found off Bequia. 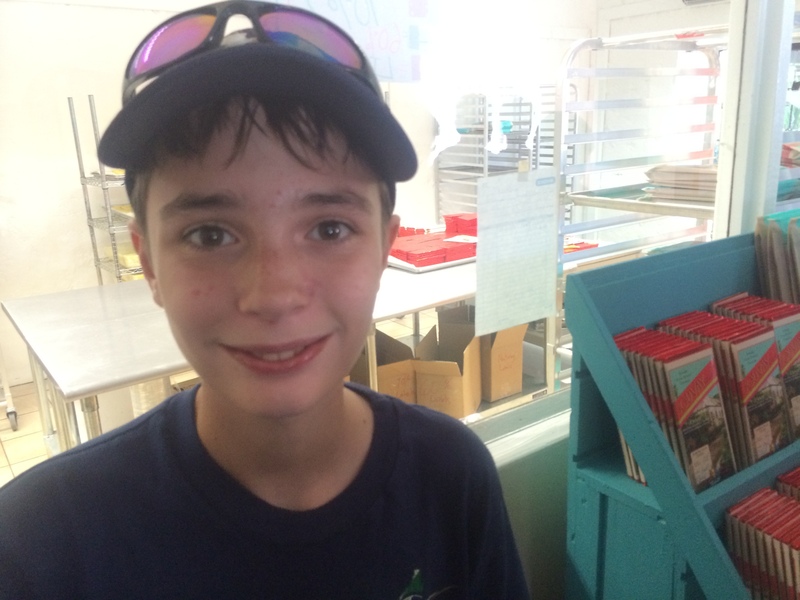 Click for new posts by Owen (here) and Megan (here). Last week we made a short visit to Tyrrel Bay, on the island of Carriacou. It was Memorial Day weekend, so shops and restaurants were closed. Most everyone was “hanging out” at the shore: the kids swimming, the moms talking with each other, the dad’s drinking beer, and the old men slapping down dominos. 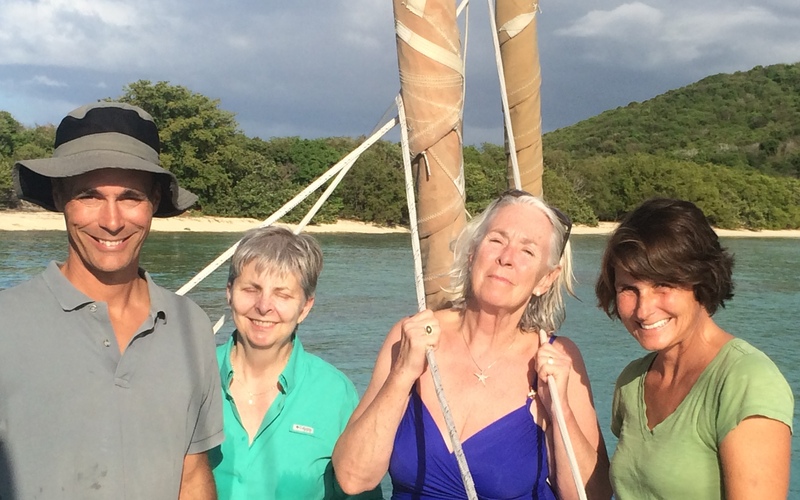 Next we sailed to Grenada… downwind (a rare treat these last six months)! We will spend two weeks preparing Strider for haul out. There is much to do – cleaning, maintenance, and decommissioning systems – but we’ll also try to squeeze in a mountain hike and maybe a little scuba diving. In late June we fly back to the States to visit family and friends. 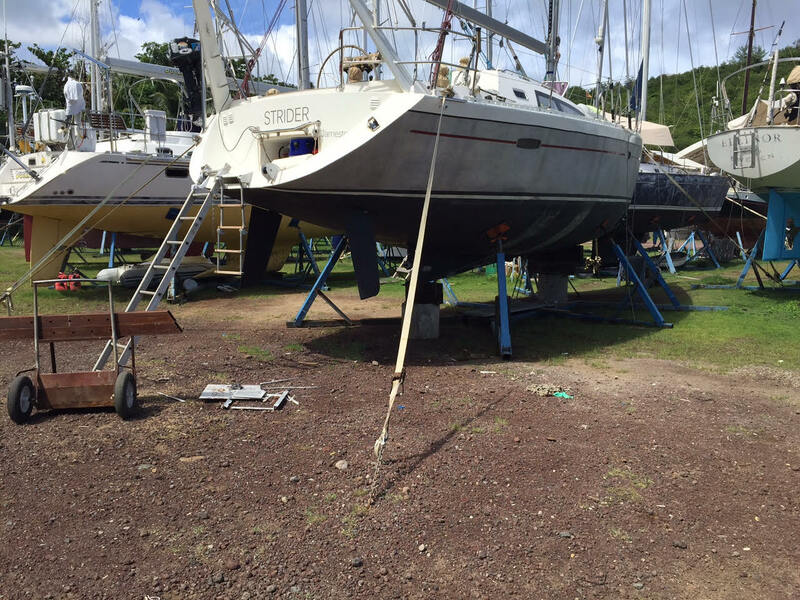 We will try to adjust to life on land, while Strider weathers the hurricane season in a special steel cradle at Grenada Marine. Prior to Martinique we stopped in Portsmouth, Dominica, for a rainforest hike and some fresh fruit. The mangos are in season; you can buy them perfectly ripe for 50 cents a piece, or you can pick your own from a nearby tree. We demolished a dozen or so – each! The tradewinds reasserted themselves over the weekend, and Strider romped across the straits from Dominica to Martinique, making 8.5 to 9 knots. We anchored 50 yards off the beach in downtown St. Pierre, with Mount Pelee looming in the background. A scientific team now monitors the volcano, dormant since the 1920s, but during our stay we couldn’t help but keep a wary eye on the 4,000 foot-high peak. If it began spewing smoke and ash we would hoist anchor and make our getaway. 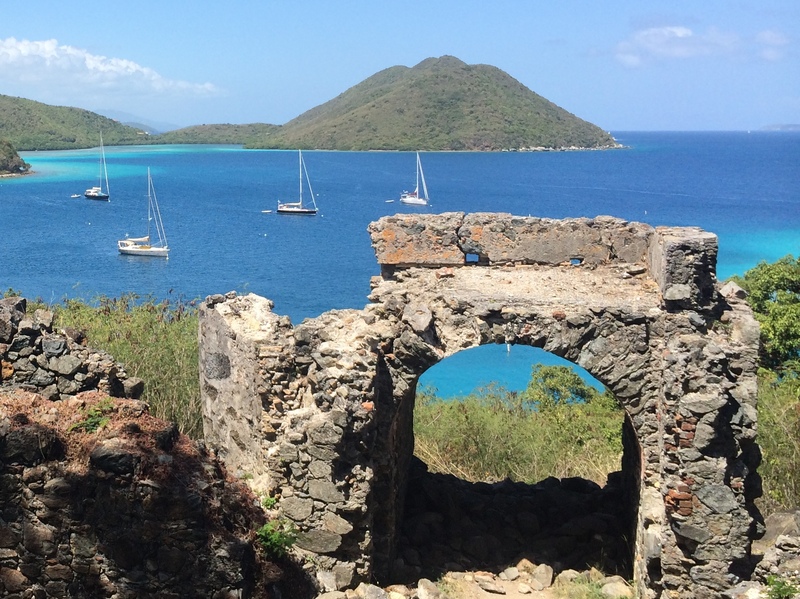 Challenging destinations brought rich rewards during our recent visits to Saba, Statia, St. KItts, Nevis, and Montserrat. The first hurdle was simply sailing to these islands. With the winds constantly on the bow from Vieques to Guadeloupe, we sailed 320 close-hauled miles in order to advance 240 miles to windward. There were some long days, but it was more fun than motoring or working in the office. 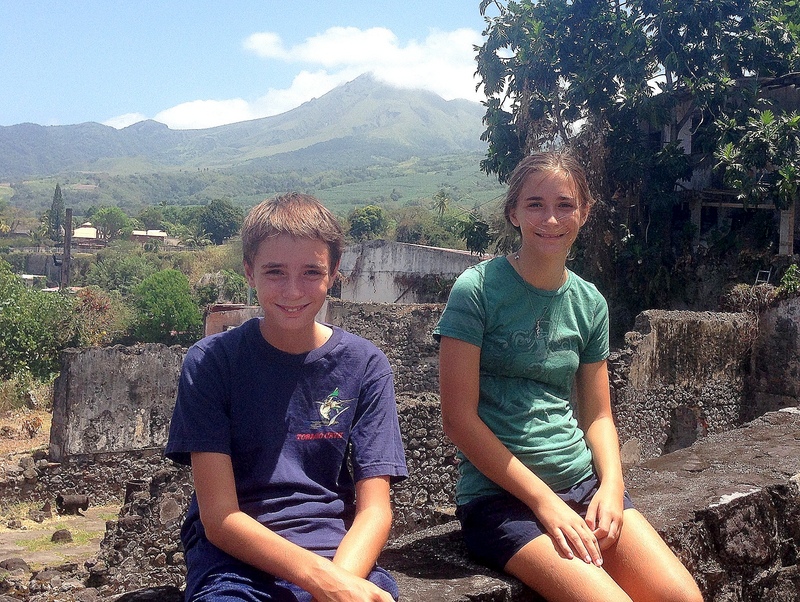 St. Kitts and Nevis offered respite for Strider’s weary crew: beautiful white beaches, shops, and well-kept historical sites and museums. We were charmed by Nevis, where the bustling energy and local character felt more genuine than Basseterre, St. Kitts, which was friendly but also host to cruise ships and high-end resorts. In Charlestown, Nevis, we visited Alexander Hamilton’s birthplace. We gained a new perspective on the founding father, who, as a poor immigrant from the Caribbean, felt most at home in cosmopolitan New York. He was arguably more American than his contemporaries, whose identify and allegiance lay with their home states. We wondered at how a boy who grew up amidst sugar plantations become active in the anti-slavery movement upon his arrival in America. 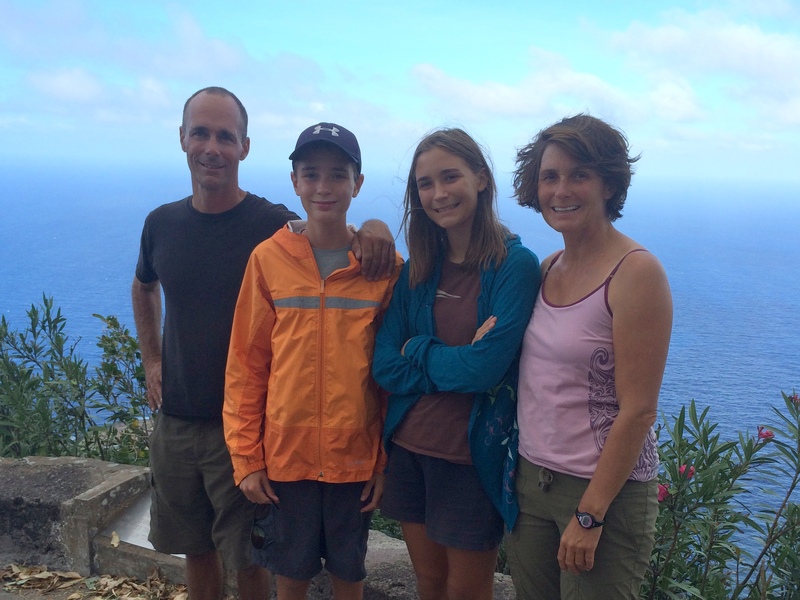 The islands of Saba and Montserrat share less than a 1/4 mile of white, sandy beach between them, but they were the family’s recent favorites. 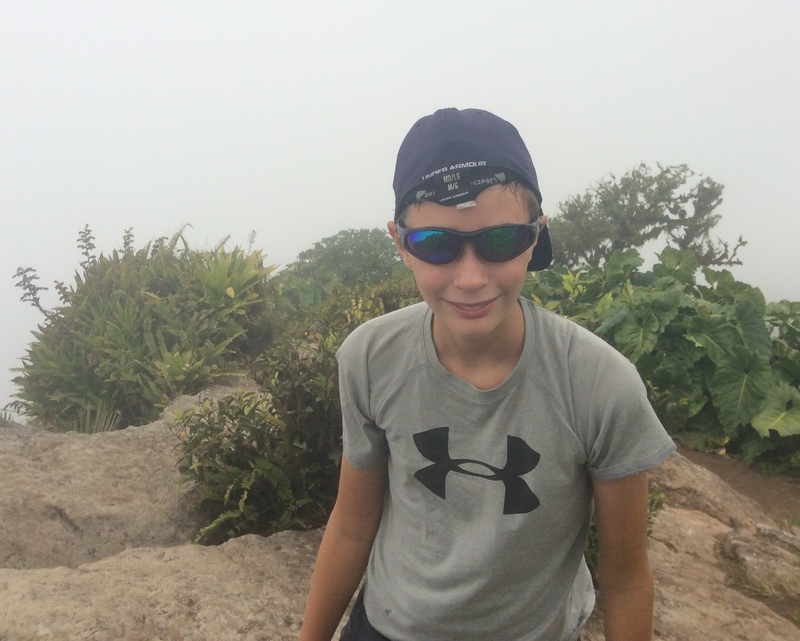 Owen shares his impressions of Saba, here. 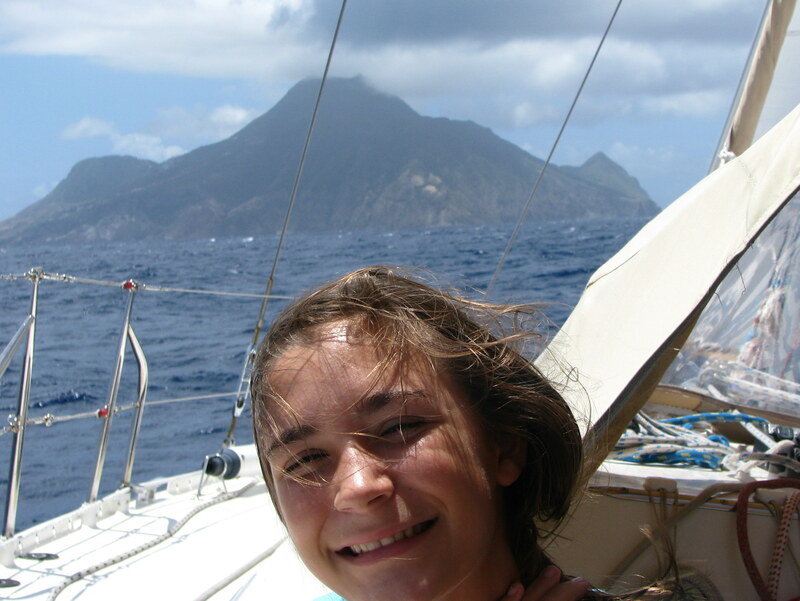 Megan writes about Montserrat’s volcano and its history, here. What is special about these islands? They offer a sense of adventure: anchoring in deep water exposed to wind and waves, maneuvering the dinghy to a pier between large swells and setting a stern anchor to keep the dinghy safe, and hiking over steep, rugged terrain. Both islands are beautiful, with vistas of mountain peaks set against wind-swept seas and intimidating views of white surf grasping at jagged cliffs. They reward sailors with a more secluded, less-commercialized experience; few cruising boats visit these places, and cruise ships are unknown. Saba and Montserrat provide a valuable perspective on the relationship between man (or woman) and nature. For centuries Saba held development at bay, forcing its residents to climb hundreds of stone steps merely to carry life’s necessities to their hilltop homes. Today it yields to modernity, with a tiny harbor enclosure, airport, and automobiles, but it does so begrudgingly. Sabans still build their roads and houses with the respect that is due this steep, rocky outpost. Meanwhile, Montserrat has spent the last 18 years teaching humanity a lesson about the power of nature. Beginning in 1995 Mount Soufriere’s eruptions destroyed the capital of Plymouth and the airport, forcing the evacuation of the southern half of the island. People lost their homes, belongings, and jobs, and they spent months or years living as refugees. Ultimately, more than half the island’s residents emigrated, and the remainder squeezed into small settlements on the north half of the island. These are the visible consequences, but life was certainly disrupted in other ways, too. One can only guess at the cost for marriages, families, and mental health, not to mention the basic opportunity costs for people who missed the chance to attend school, work, and accumulate savings. On the other hand, the greatest lesson we learned on Saba and Montserrat concerns the enduring strength of small-island communities. 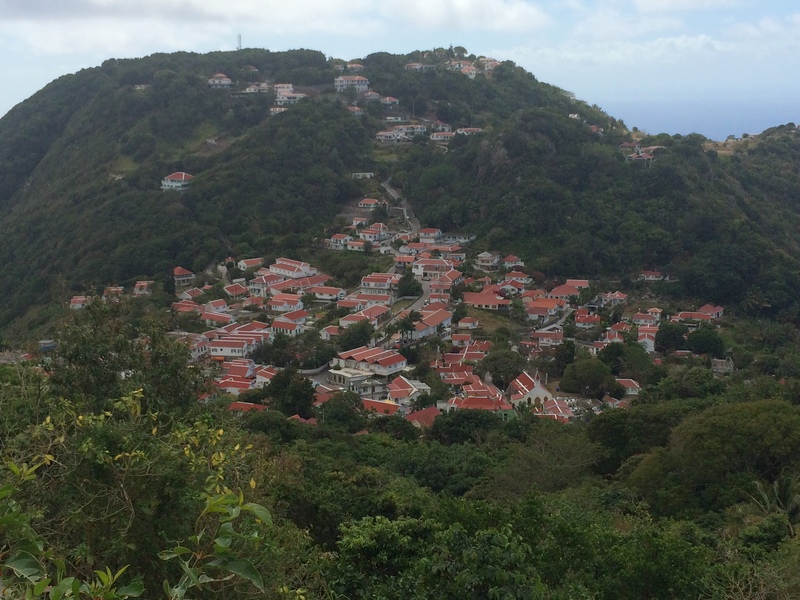 We wrote of this in our last post about Saba, where people of diverse cultures and ethnicities have built a community that is orderly, inclusive, and remarkably cohesive. On Montserrat one can only marvel at the strength of people who have faced wrenching changes and uncertainty. They have lived in school classrooms and churches, taken each other into their homes, and constructed temporary housing and government facilities, determined to endure until things returned to normal. Then, as Soufriere defied scientists’ predictions and continued to erupt, people came to accept that the changes were permanent. Now they are building new homes, new communities, and new lives. Through it all, they are unfailingly friendly and optimistic. They honk their horns, wave, and call to each other by name. “God bless,” they say to both friends and strangers, and “God provides,” they explain to those who wonder how they can be so upbeat. Joe Phillip makes a living providing tours of the affected areas. He talks with Colin by a hotel pool. Volcanic flows have added to Montserrat’s eastern shoreline. Will people build here, someday? Megan and I enjoy some sweet sailing. 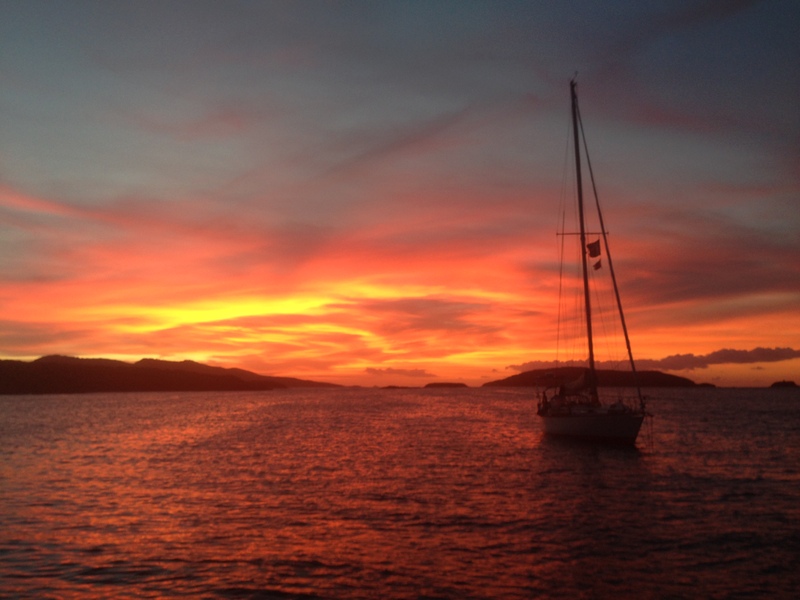 Just before sunset on March 2nd we hoisted anchor and set sail from Prickly Bay, Grenada. 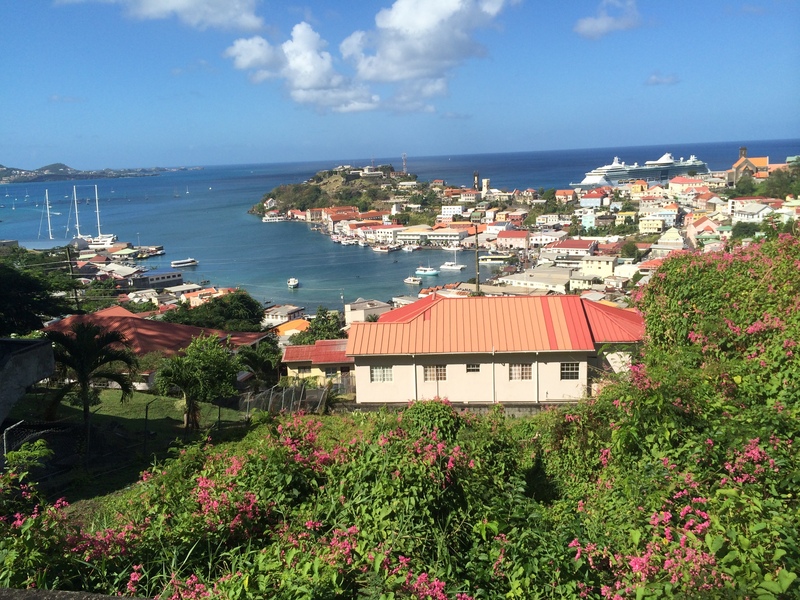 St. Martin lay 380 nautical miles north, or two-and-half days sailing on a close reach. While the kids and I slept, Blaire took the first night watch, and at 2330 she was treated to a squall with 32 knots and heavy rain. She called me on deck, and together we took a third reef. I assumed watch, spending the first two hours of my birthday soaking wet and huddled behind the dodger as the rain continued and the wind blew 25-30 knots. I actually relished the novelty of shivering, as I hadn’t felt cold in many months. 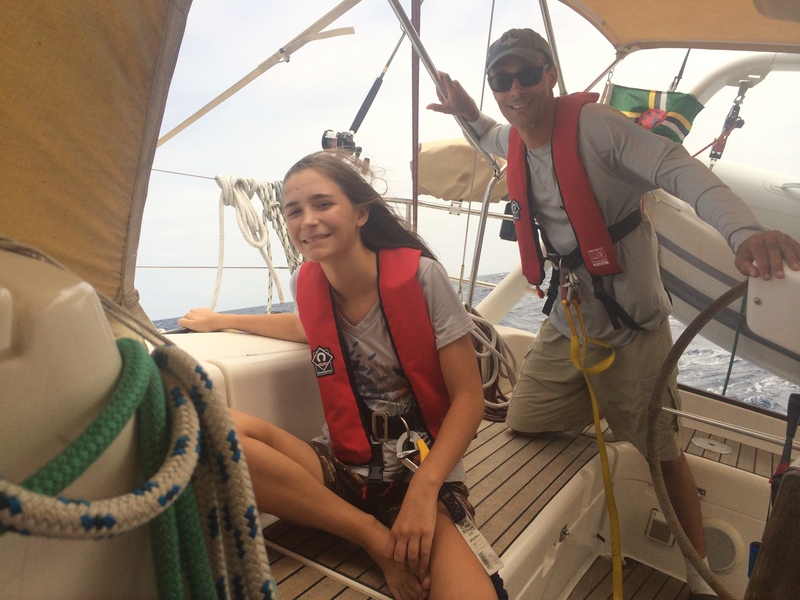 Blaire and continued with two-hour, watches, and by sunrise we were 30nm west of Bequia. Owen and Megan slept peacefully. The seas were steep and lumpy because the northwest-bound equatorial current was cutting across the wind and waves, but Strider moved at 6.5 – 7.5 knots while Owen and Megan slept peacefully in their bunks. 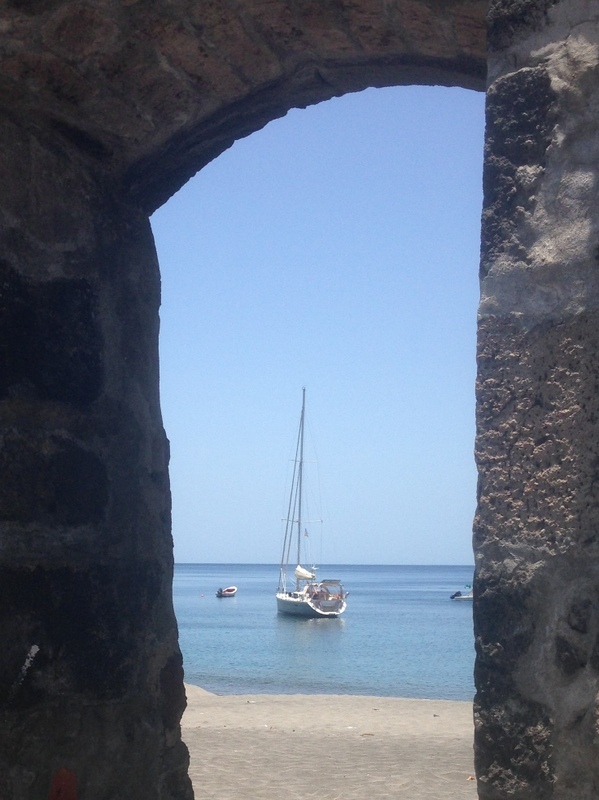 For the next two days we sailed straight for St. Martin on a close reach. 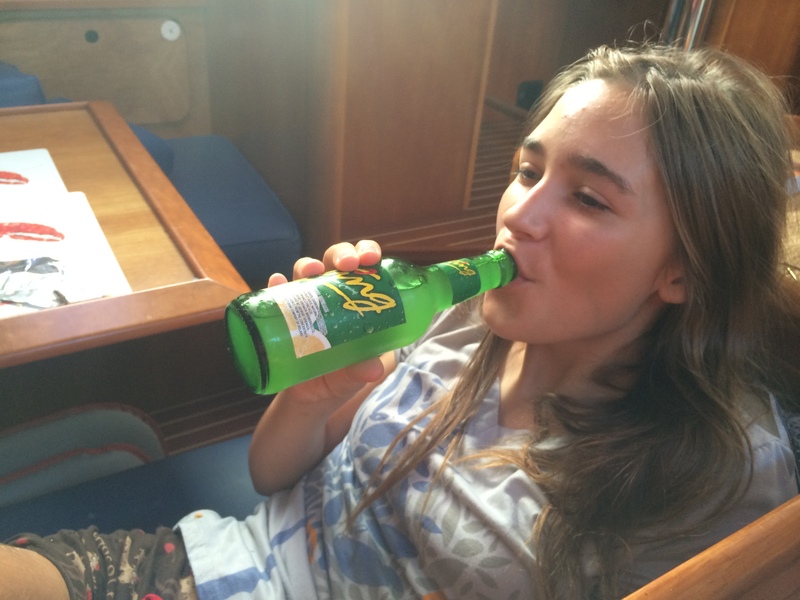 We used a triple-reefed main with full jib during the day, when winds ranged from 22-28 knots, and we swapped the jib for the staysail during the nights and early mornings, when the breeze blew in the high 20s with squalls of 30-34 knots. As the squalls approached we raised the centerboard, allowing Strider to slide to leeward during the stronger gusts. 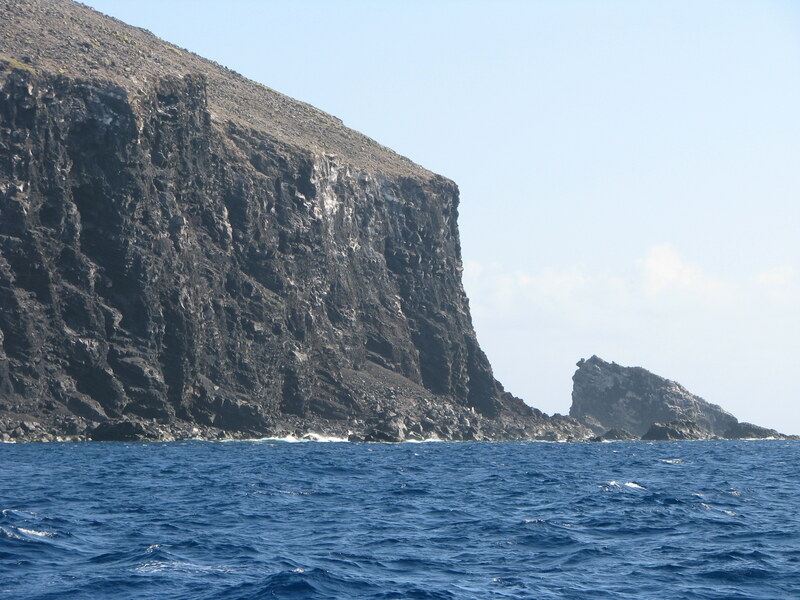 With seas running ten feet we met an occasional set of fifteen footers, and passing the Statia-Saba channel Strider leapt over a set 20 foot walls. Ironically, it was not the primary swell that was uncomfortable but the secondary, current-driven chop that made the ride uneven. 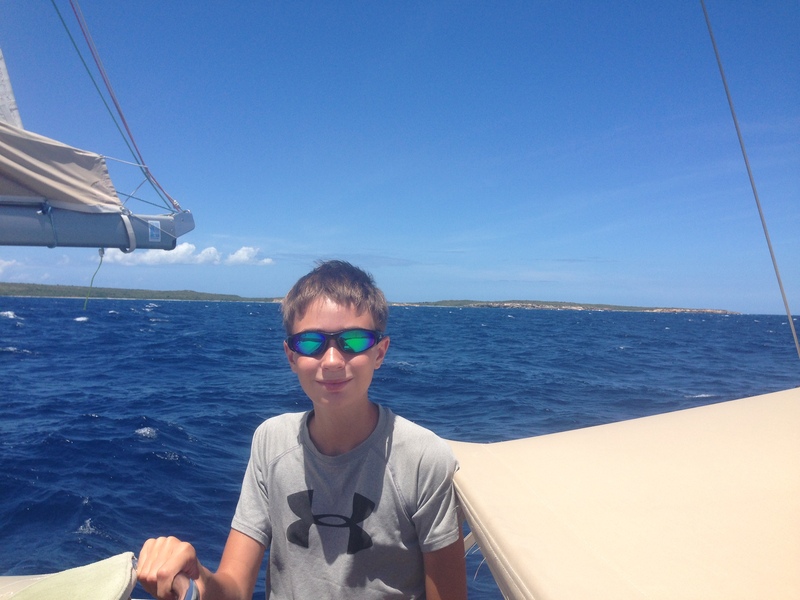 Megan and Owen found that the center berth, directly over the centerboard, offered a comfortable motion in lumpy seas. They say a good boat can handle the elements better than the crew, and we did grow tired of the unrelenting heel and lumpy seas. Still, it was a “good tired.” By the third day Blaire and I were able to sleep long and deeply in our births, and we switched to longer watches. Meanwhile, Owen and Megan handled the passage like true “Salty Dogs.” The took care of themselves, eating and drinking fluids, and they moved carefully about the boat, clipping into their tethers before climbing the companionway to visit Blaire or me in the cockpit. I won’t pretend the passage was fun for them, but they never complained, and they finished with a real sense of accomplishment. I was proud of them both. The porpoises seemed animated by the brisk conditions, leaping clear of the water (but eluding our camera). We will keep a few memories from this passage. 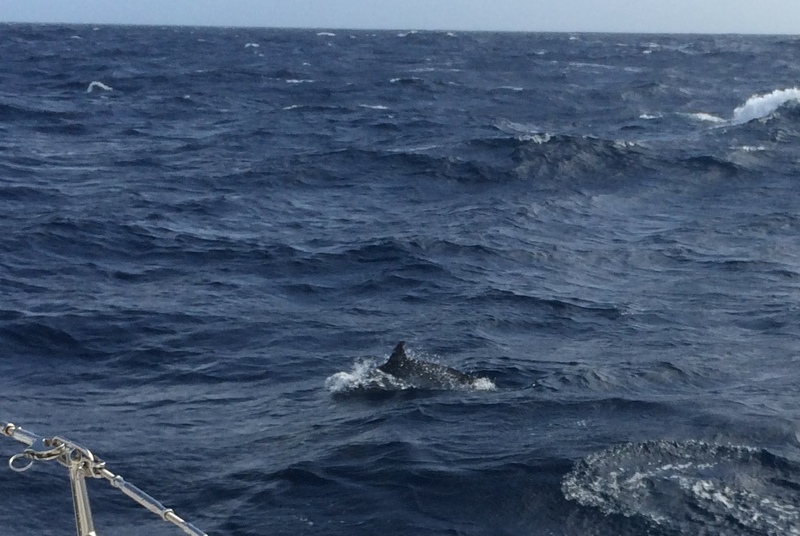 On the second day we were visited by a pod of fifteen, leaping Atlantic porpoises. We celebrated my birthday in the cockpit, opening presents and guessing the flavors of jelly bellies, a pleasure which somehow proclaimed our defiance of the elements. During the second night Blaire was startled by the strong smell of diesel exhaust, and she strained to see into the darkness, thinking that a container ship was about to smite us. Instead, she was able to discern a cutter-like vessel, lights out, circling Strider at less than a hundred meters. She could see the silhouettes of gun mounts, and red night lights inside the bridge, but they neither showed navigation lights nor hailed us before moving away. The next morning we were visited by a Dauphin helicopter from the French Navy. They made a low pass down the port side then pitched around to hover 100 feet off our stern, taking photographs. I was not concerned, having made plenty of low passes in my own Navy days, and I gave them a friendly wave. 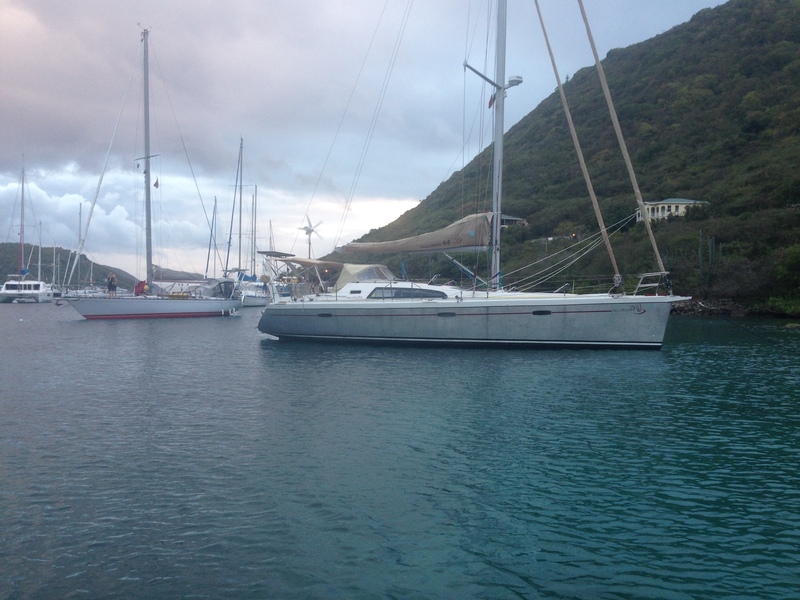 No doubt our position 80nm west of Martinique fit the profile of a drug runner more than a typical cruising boat. Alchemy and crew: Barrie, Sarah, Peter, Simon, and Andrew North. Sailing into Marigot Bay at 1000 on March 5th, we achieved our goal for this passage: reuniting with the Norths, friends whom we had not seen since Dominica. 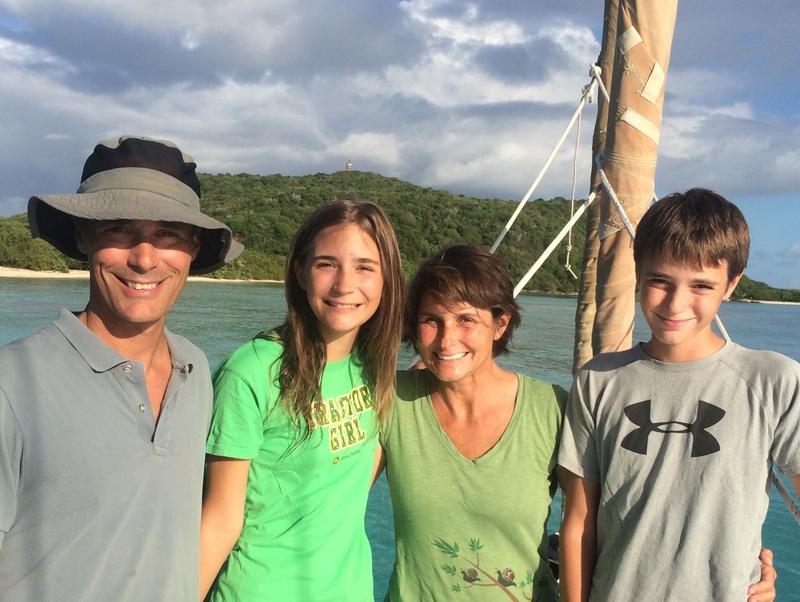 We anchored directly to windward of Alchemy, and Owen and Megan joyfully reunited with Peter, Simon, and Andrew. Blaire and I stowed our gear, took showers, and enjoyed a cold beer, not necessarily in that order, and then we enjoyed some quality time with Barrie and Sarah. 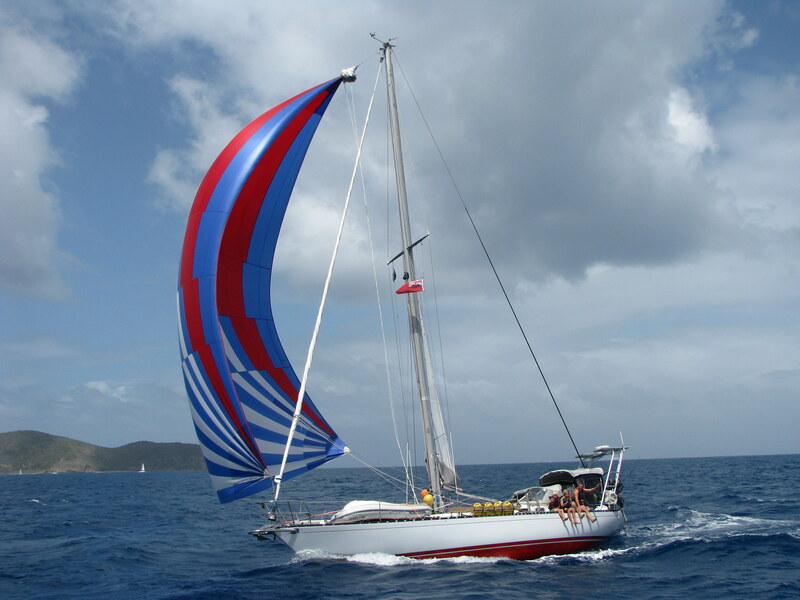 Strider and Alchemy have sailed in company since then, making our way from St. Martin to Virgin Gorda, Tortola, and St. John. Owen wishes he could work at the Grenadian chocolate factory. Riding the #2 bus with a few friends. At the wheel of each “bus” is a hard working entrepreneur with his business name in the window. 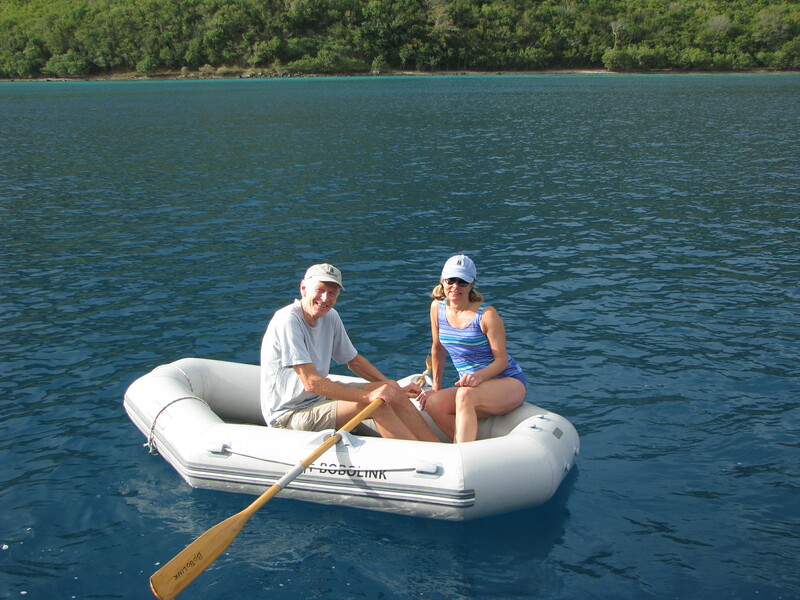 Most cruisers anchor their boats in one of Grenada’s many beautiful bays on the south coast. Here they meet other sailors, participate in daily social events, whether dominos or beach parties, and share information via the morning “cruisers net” on the VHF. 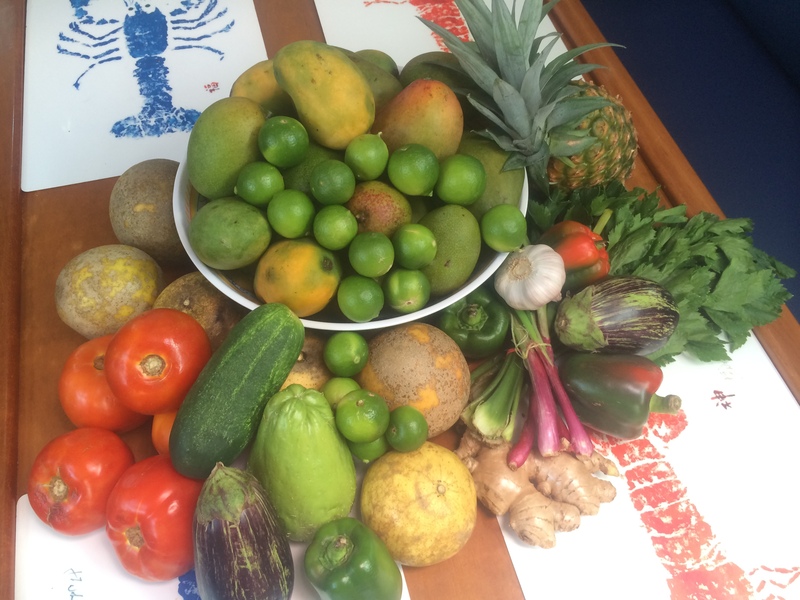 It would be easy for a sailor to lime away in this expatriate community without getting a glimpse of the real Grenada. Fortunately, few actually do this, because getting around the island is so easy. On many days a cruiser-organized shuttle offers rides to local markets or community events. Otherwise, catching a local bus is cheap and easy. You simply walk down the road until the right-numbered bus drives by. You can flag it down, but no worries, the “conductor” will already be hanging out the passenger window, motioning you to jump aboard. 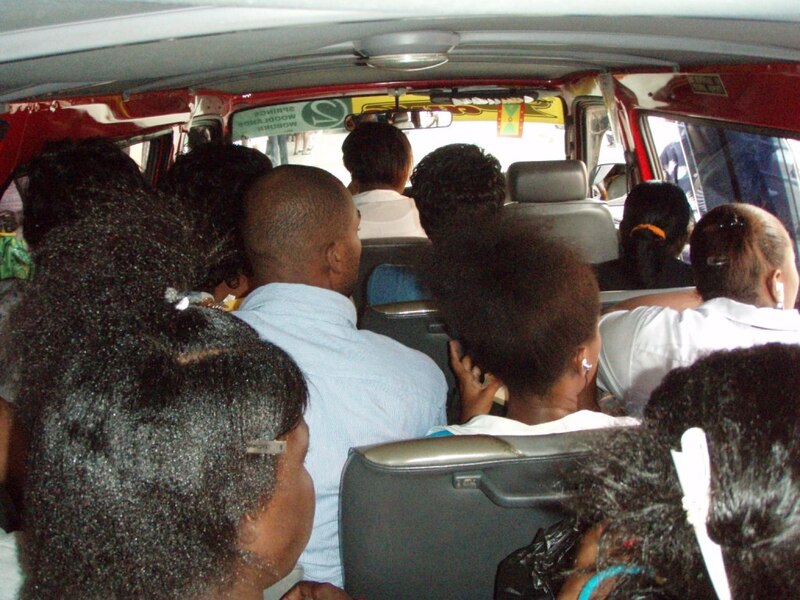 For less than $1 U.S., you can go just about anywhere with a minivan full of friendly locals. There’s usually an empty seat; if not, people crowd in anyway and perch one cheek on a seat. Worst case, you wait for the next bus, which comes within a minute or two. 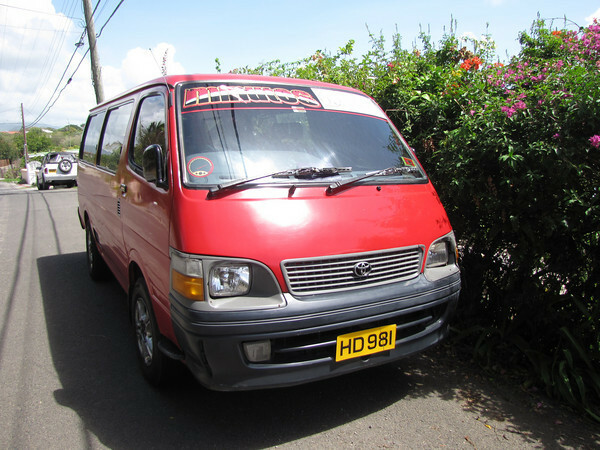 With Soca music blasting so loud your whole body vibrates, your van makes its way through Grenada’s streets, discharging and picking up passengers with incredible efficiency. A big turnout for the Tivoli Drummers! 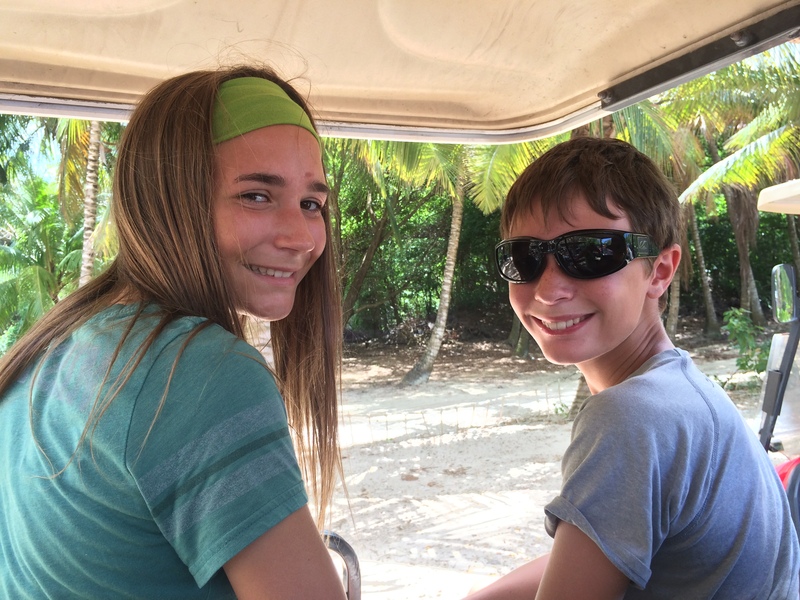 For nearly three weeks in Grenada we rode busses, hired tour guides, and walked a great deal, trying to see as much as possible. Our favorites included the Tivoli Drummers, a collection of drumming, acting, and singing performances by community artists from across Grenada. They performed at an open-air stage in a clearing across from the gas station of a small coastal town. 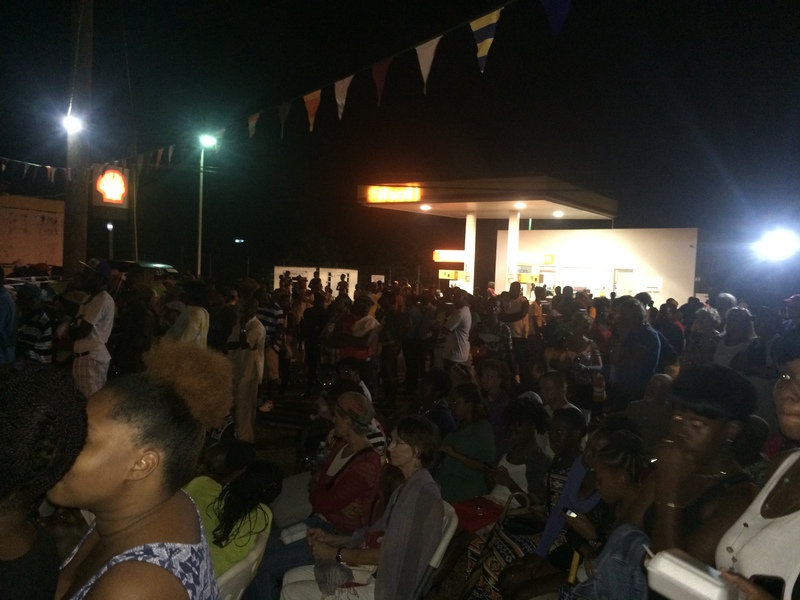 The audience consisted of twenty-odd sailors like us and about 320 local Grenadians. We knew this was an authentic scene when they took a break from the music to allow a committee of representatives from local towns to perform a skit about AIDS awareness and domestic violence prevention. It was smart, well acted, funny, and decisively not politicaly correct. The audience loved it. Our favorite restaurant was Aziz’s schwarma stand, an evening hang out for the students from St. George’s university. Aziz cooks delicious, affordable, Middle Eastern food with an American-Caribbean twist. Born in Syria, raised in Trinidad, and a 15-year resident of the United States, Aziz is savvy and cultured, but above all he is a a good businessman and a really likable guy. We talked with him one evening about his family in Syria. I asked Aziz if he is concerned for their safety, and he explained that he worries, but his oldest brother will never leave because he refuses to give up their land, a large grove of olive trees in the family for generations. His other brother will also never leave, because as a highly respected doctor he cannot turn his back on his fellow Syrians when they need him most. We wished Aziz the best of luck for his brothers, and we hope to see him soon. St. George’s, the capital, and the fort where a handful of Cubans and members of the socialist government made a stand against America forces in 1983. As an American I could not help but wonder what Grenadians think of the invasion of their country 31 years ago by American forces, so I asked some people I met. It was explained to me this way. No one believes the American line that the operation was a “rescue mission,” because according to Grenadians the American students were never in danger. However, only a small, radical minority views the operation as an unjust invasion and a counter-revolutionary coup. The majority view the operation as an “intervention” – the exercise of American power to preserve American interests with an outcome that was also in Grenada’s interests. In other words, they don’t see the American invasion in romantic terms, but overall they think it was a good thing. I was struck by the maturity and hard-headed realism of this viewpoint. The highlight of our visit to Grenada was the day we spent touring three “factories,” which produce three quintessentially Grenadian products that also happen to be favorites of ours: nutmeg, chocolate, and rum. We try to give you a sense of the action with the photo gallery below, but understand that these places must be smelled and tasted to be truly appreciated. Sorting mace (the flower) from nutmeg (the nut) for drying. Sorting nutmeg and bagging for shipment. Drying coco beans, after they have fermented, in preparation for roasting. Crushing sugarcane with a watermill, still going strong after 200 years in operation. The crushed and dried cane provides the fuel to boil the sap. Hardwood fuels the still. Feeding the fires is a hot job. The rum is distilled repeatedly until it reaches 150 proof. (Colin, not Megan) sampling the final product. Do not drink this rum near an open flame.